17,000 lumens from only 180W. 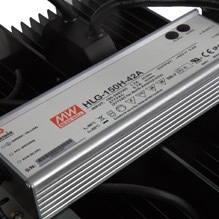 Advanced design, multi-fin heat sink systems and superior efficiency drivers from Meanwell™ deliver an astonishing 17,000 lumens from only 180W. 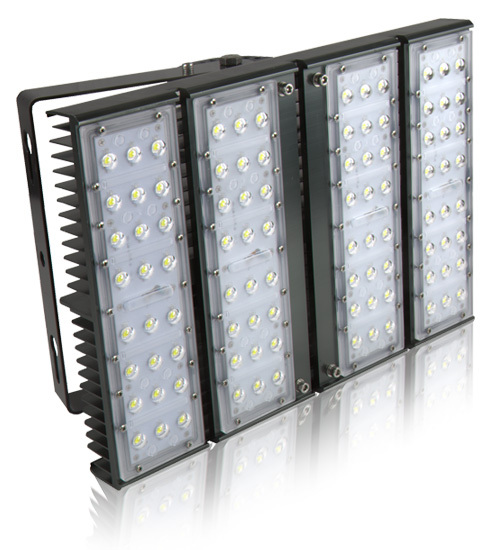 The TITAN™ High Power LED Flood Light acts as an ideal replacement for 500-1000W incandescents. Advanced design aluminium multi-fin heat sink systems in combi- nation with high efficiency drivers from Meanwell™, TITAN™ is able to deliver an astonishing 17,000 lumens. Individually lensed with an array of integrated 1 Watt high powered Epistar LEDs for uniformity & optimum luminaire performance, with further benefits such as minimised attraction to nocturnal wildlife due to non-ultraviolet light, high light output even in cold temperatures and a wide range (60 -180W) to suit round the all environments. 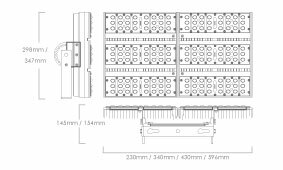 Ideal replacement for 400W SON in a variety of mounting options; adjustable bracket around 165 ̊ angle hence suitable for wall mounting, suspending or post-top mounting. Further benefits include optional DACROMET® corrosion resistance anodisation for corrosive/high-salt atmospheres, as well as dimmable options: 1-10V (-AD) & DALI (-DL) with advanced programmable occupancy controls suitable for daylight & occupancy detection/dimming.